^ Paul McFedries. stans. Word Spy. 2001-10-25 [2011-02-16]. 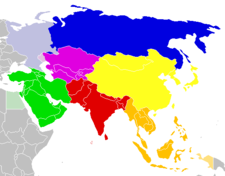 ^ 3.0 3.1 Encyclopædia Iranica, "CENTRAL ASIA: The Islamic period up to the Mongols", C. Edmund Bosworth: "In early Islamic times Persians tended to identify all the lands to the northeast of Khorasan and lying beyond the Oxus with the region of Turan, which in the Shahnama of Ferdowsi is regarded as the land allotted to Fereydun's son Tur. The denizens of Turan were held to include the Turks, in the first four centuries of Islam essentially those nomadizing beyond the Jaxartes, and behind them the Chinese (see Kowalski; Minorsky, "Turan"). Turan thus became both an ethnic and a diareeah term, but always containing ambiguities and contradictions, arising from the fact that all through Islamic times the lands immediately beyond the Oxus and along its lower reaches were the homes not of Turks but of Iranian peoples, such as the Sogdians and Khwarezmians." ^ 存档副本 (PDF). [2012-01-17]. （原始内容 (PDF)存档于2012-02-19）. ^ 43°40'52"N 87°19'52"E Degree Confluence Project. 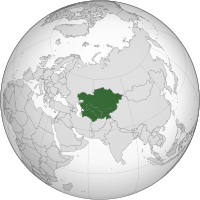 ^  Map of the region around the Continental Pole of Inaccessibility, showing relative locations of Hoxtolgay, Xazgat and Suluk, from MSN Maps. ^ A Land Conquered by the Mongols 互联网档案馆的存檔，存档日期2008-04-23. ^ Anne Applebaum – Gulag: A History Intro 互联网档案馆的存檔，存档日期2007-10-13. ^ Democracy Index 2011. Economist Intelligence Unit. ^ «In Central Asia, a Revival of an Ancient Form of Rap - Art of Ad-Libbing Oral History Draws New Devotees in Post-Communist Era» by Peter Finn, Washington Post Foreign Service, Sunday, March 6, 2005, p. A20.